Just in time for Halloween, Pumpkinhead appears. Pumpkinhead is the demon of vengeance. When two young children are killed in a hit and run, their hillbilly parents ask a local witch for help. She summons Pumpkinhead to kill the perpetrator and those who shelter him. The only way to stop Pumpkinhead is to kill him. The perp calls on the witch’s sisters to summon the demon’s five siblings: Sloth, Envy, Pride, Lust, and Greed. Soon Pumpkinhead is the least of the local’s problems. 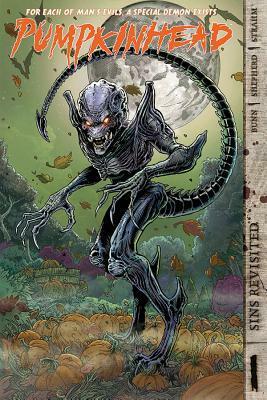 Pumpkinhead is a southern gothic horror comic that is complete within this one volume. The plot and art were good—not great. It was easy to see the ending from the beginning. I liked the backup story’s plot better. Pumpkinhead is a good choice for fans of the movie but not many others. I prefer Cullen Bunn’s original stories much more. 3 stars. Thanks to Dynamite Entertainment and Edelweiss+ for an advance copy. 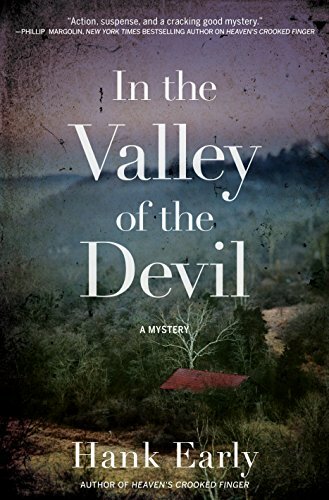 “The world never ran out of monsters.” Earl Marcus is back fighting them In the Valley of the Devil. In the rural Georgia mountain countryside, a new preacher has arrived. Jeb Walsh is running for the Senate, pushing his book and preaching his version of hate and intolerence at his town square rally. In the meantime, racist graffiti is turning up all over town. A rumor about Old Nathaniel, a hooded racist killer, has resurfaced after several African-Americans are reported missing. Earl has recovered from the incidents in Heaven’s Crooked Finger (see my review). He is now a private detective. When his African-American Atlanta police officer girlfriend, Mary, is kidnapped, Earl pulls out all the stops to find her. In the Valley of the Devil really lives up to the thriller label. It is an exhilarating pulse-pounding ride to the finish. Highly recommended but I cannot overemphasize the need to read Heaven’s Crooked Finger first. Events in the first book continue to impact the characters in this book plus there are major spoilers in here. Luckily, both the first book and this one are excellent and earn 5 stars! Thanks to the publisher, Crooked Lane Books, and NetGalley for an advanced copy. Layers of secrets abound in Heaven’s Crooked Finger. 50-year-old Earl Marcus returns to his hometown in the mountains of Georgia that he left after a failed snake handling forced on him by his father RJ almost killed him at seventeen. RJ is recently deceased and was a fundamentalist preacher in a snake handling church he created decades ago. Earl’s brother, Lester, is running the church but there is talk that RJ has returned from the grave. Earl, who works as a Private Detective in North Carolina, investigates this mystery and others along the way. The southern gothic atmosphere of lightning (i.e., heaven’s crooked finger), religious fervor and snakes makes this a great fall read. The character dynamics of Earl, Mary, Granny and Rufus make their interactions interesting. The resolution of the mystery is difficult to figure out though some of the clues were easy. I read this book in less than two days. I woke up in the middle of the night to read it because it was that compelling! This is the first book in a series. I will be pre-ordering the second in the series as soon as it is available. 5 stars! 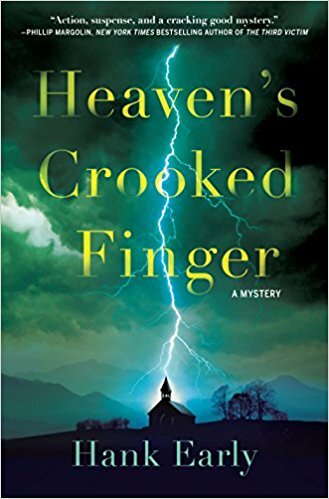 I won Heaven’s Crooked Finger in a Goodreads giveaway but that has not impacted my review.